The beautiful grounds of the Great Valley House are perfect for a walk under the ancient oak, maple and walnut trees. The romance of three hundred years preserved. A gourmet breakfast is served each morning in front of the large 14-ft. wide walk-in fireplace. Enjoy the 18th century experience to linger over that last cup of coffee. Guests at the 300-year old Great Valley House can enjoy the backyard swimming pool between Memorial Day and Labor Day. In the words, of William Butler Yeats, “There are no strangers here; only friends you haven’t yet met.” Named after an early 18th century owner, this large corner room is warm and welcoming, inviting you to stay awhile. 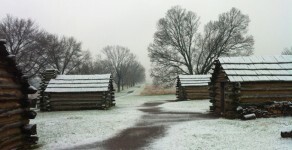 The 300-year old Great Valley House of Valley Forge is open year round, including holidays. Stay at the Great Valley House during the winter months and know that George Washington’s troops had a similar experience at Valley Forge in 1776. 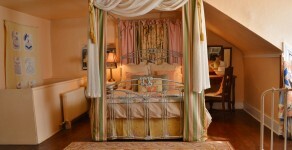 Step back in time in this charming, cozy guest room filled with antiques, vintage quilts and a ceiling-canopied bed. Marvel at the original 18th century beams and thick stone walls. Taking its name from the Great Valley House owner during the Revolutionary War, the John Wilson Room exudes a feeling of warmth and charm with its queen canopy bed, antique furniture and vintage quilts. An inviting area for guests to gather and for quiet comfort in a relaxed atmosphere. The Sitting Room, with its antique furniture, original centuries old floor boards invites visitors to read, listen to music or enjoy the company of others.